This zone is mainly composed of former industrial districts. Some industry is still present here, but this is now more of a residential zone that is largely populated by immigrants. There are pubs and restaurants along the canals. 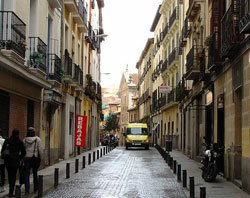 The neighbourhood of Barona, known as a worker's quarter, is considered an unsafe area, especially at night along the Via Lope De Vega. Evidence of the zone's former industrial past can still be seen old buildings in various stages of disrepair, either in low-income areas or not far away from the new, middle- and upper middle-class neighbourhoods. Zone 6 also has a higher than average percentage of older people.